Universities being the repositories of knowledge creation are the source of significant contribution to the civil society. Institute of Administrative Sciences (IAS) is one of the most prestigious and forward looking institutes of University of the Punjab offering an array of degree programs ranging from undergraduate to graduate and postgraduate levels. The education it imparts plays a pivotal role in mitigating the challenges of real life by equipping the graduates with best use of acquired knowledge, competencies and behaviors to excel in their chosen professions. Like every year, IAS organized its Graduation ceremony 2018 to honor its highly competent graduates of the year 2016 from different programs including; Masters of Philosophy (MPhil.) in Management, Master of Public Administration (MPA), Master of Human Resource Management (MHRM), Master of Marketing (MMKT), Master of Health Administration (MHA) and BS Management. Ms. Ayesha Hanif - faculty member at IAS warmly welcomed the worthy guests, graduates and parents at the highly auspicious and memorable occasion of their lives and hosted the event. The ceremony began with the academic procession marching towards the stage in their academic robes and sitting on stage. After seeking formal permission of the Dean FEMS & Director IAS, the Graduation was announced open. Recitation was made by Hafiz Huzaifa-tur-Razzam (BS Management student) and Naat to pay tribute to the Prophet (PBUH) was presented by Mr. Zamin Abbas (BS Management student). It was followed by a formal address of Prof. Dr. Nasira Jabeen – Dean Faculty of Economics & Management Sciences (FEMS) & Director IAS. She welcomed the graduating scholars, their parents, families, distinguished guests and faculty members. 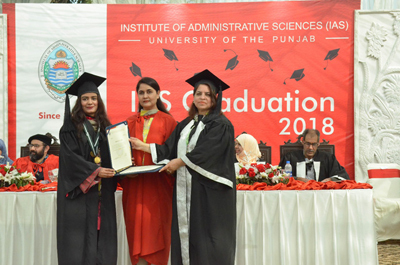 She said that due to increasing number of programs and graduating students, not all graduates get the opportunity to participate at the main convocation ceremony of the University of the Punjab. Therefore, in order to provide an opportunity to all IAS graduates to participate in the historic event of their life time achievement, IAS annually organizes the graduation ceremony at the institutional level to give a proud feeling of accomplishment to every graduate with the belief that ‘EVERY GRADUATE MATTERS’. The worthy director shared the journey of 56 years of success, growth and excellence of the Institute and shared significant glimpses of academic achievements. 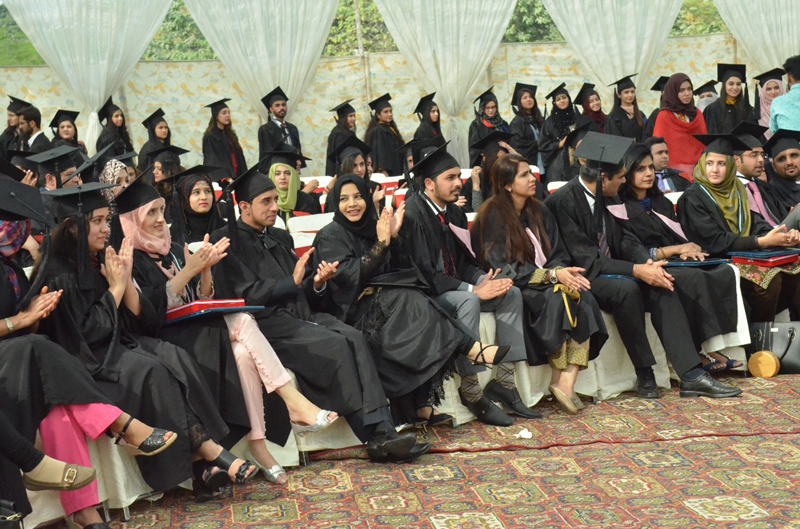 She shared with great pride that previous year, BS Management Program was launched at PU Jhelum Campus to enhance the outreach of our program and to offer quality education at doorstep. She added that MS Marketing Program will also be started next year at IAS. She mentioned that all of our academic programs are carefully developed in view of the global realities and cultural conditions. They are well aligned with IAS vision, mission and values that are yet again aligned with the overall vision of University of the Punjab. From the enrolled student body of nearly 1500 at IAS, 300 students graduate from the institute annually and add to the unique asset of worthy alumni. Teaching faculty at IAS is highly qualified and professionally competent that brings the best practices to the classroom for their students. They represent themselves and University of the Punjab at national and international conferences, seminars, workshops and stay abreast with the latest knowledge and practice. The staff members of IAS are highly committed and work day and night to contribute towards the development of the institute. While talking about the competitive edge of IAS, Prof. Dr. Nasira Jabeen added that we at IAS prepare our students to appear for competitive exams through CSS guidance forum, promote entrepreneurship and self-employment besides preparing students for careers in third sector organizations. Above all, IAS leverages potential of its students to be good human beings that is the most important contribution to the society. Being vibrant and dynamic institute of the University, IAS maintains academic and professional linkages and partnerships with national and international bodies, organizes conference and seminars at international and national level and publishes its research journal, ‘Governance and Management Review’ on regular basis. Faculty of IAS contributes in research and development by attending and participating at national and international conferences. IAS maintains regular contact with its alumni through its Career Advisory and External Linkages (CAEL) department and they contribute with great commitment towards students’ career placements, professional grooming and development of the institute. Prof. Jabeen encouraged the graduates to attend the upcoming Alumni Reunion to be held on December 22nd 2018 to network with senior and fellow alumni. 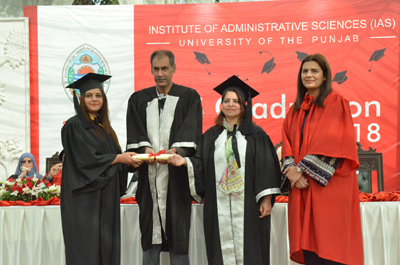 She also shared a few innovative and community development projects of the institute started with assistance of IAS alumni including, Dastarkhan; free and balanced meals for staff, Employee Recognition days, dedication of prominent places of the institute in name of worthy professors and creation of an alumni office and an Executive Wardrobe for graduates. She also appealed the graduates to contribute towards the Executive Wardrobe Project that is initiated in spirit of “Dress for Success”. Towards the end of her enlightening speech, Prof. Dr. Nasira Jabeen shared words of wisdom for the graduates and advised them to be loyal to their professions in the real life and avoid all negative temptations by discerning professional integrity. She urged them to be sincere to their motherland - Pakistan and put their best contribution to make some difference in the society while promoting values of positivity, equity, merit, tolerance and professionalism. Dr. Jabeen immensely recognized the efforts of parents on this historic occasion. She thanked the organizing team of the event for their committed efforts and shared special gratitude for the University Controller of Examination and Press and Publication department on expediting the process of providing the degrees and timely printing of graduation folders. She thanked the worthy Vice Chancellor – Prof. Dr. Niaz Ahmed Akhtar for his endless support and encouragement towards the graduation ceremony. Successful graduates were awarded with gold medals, mementos, merit certificates, rolls of honor and degrees. A total of 08 gold medals, 08 shields, 40 merit certificates, 40 rolls of honor and 250 degrees were awarded at the ceremony. 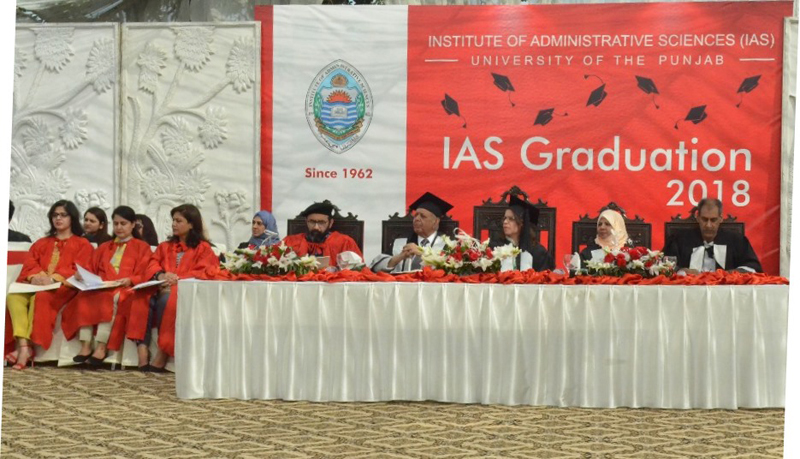 IAS Graduation ceremony has a special feature of inviting the graduates from the previous years who could not receive their degrees for any reason. Few senior alumni members registered themselves for this segment and were awarded with their degrees. Towards the end, Professor Dr. A.R. Jafri – senior faculty member at IAS, addressed the graduates and emphasized the need of hard work and commitment by the youth of the country. He shared his successful and lifetime journey of teaching at IAS that is an inspiration for others to follow. 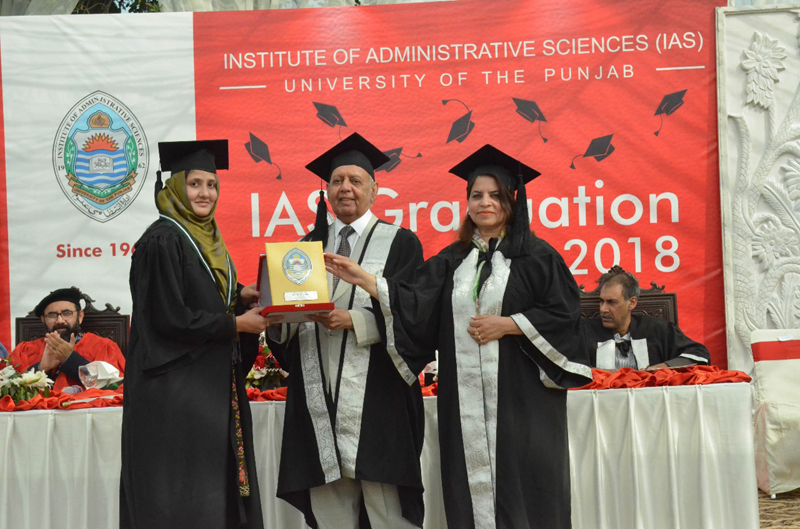 A tribute and a standing ovation was given to the endless contributions of Prof. Dr. Nasira Jabeen in establishing a tradition of institutional graduation ceremony and complete support in this regard. Assistant Controller of Examinations, Ms. Tashfeen Fatima, along with her team presented a shield to Prof. Dr. Nasira Jabeen as a token of love, respect and appreciation. The memorable event closed with group photos of graduates with teachers and parents followed by a networking session at lunch.